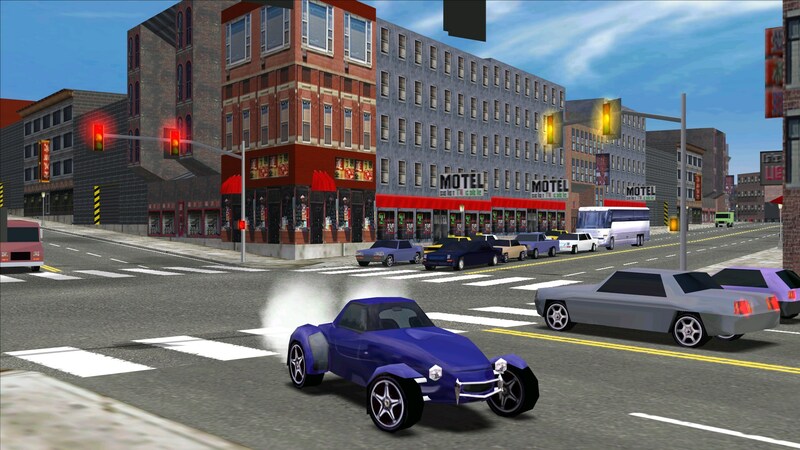 Before Burnout popularised insane street races through city traffic, Midtown Madness was giving PC gamers their own high octane thrills. 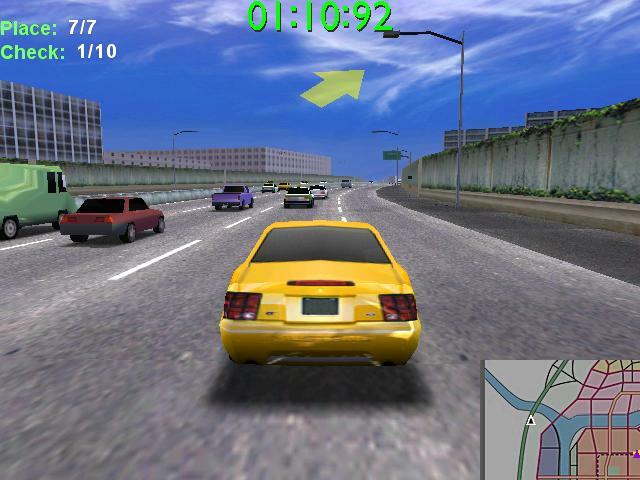 Players can choose from a variety of cars (and even a bus) and dash haphazardly through Chicago, vying to beat their opponents to the next checkpoint. The game should install without any issues on a modern PC. Simply place the CD into your computers optical drive and follow the on-screen prompts. If the autorun installer does not start automatically, browse to the CD in Computer/This PC and manually run the setup.exe program. During installation you will be asked what type of installation you want to do, we recommend choosing “Full” installation for best results. Before you try to play the game, there are two patches you should install. A small update to the games DirectPlay software (a now depreciated networking protocol) can be downloaded here (link broken? Let me know here). Secondly, you should install the Midtown Madness XP compatibility patch, which you can download here. Both of the patches download as zip files, so it’s just a matter of extracting them from the zip folders and then running them, patching should then be automatic. Getting the best visual quality from Midtown Madness can be tricky. The game itself includes functionality that is supposed to detect your graphics card and set the visual quality accordingly. The problem is that the auto-detect software doesn’t seem to work properly on more modern versions of Windows. Luckily there’s a user created patch we can use to work around the problems. To get started, disable any secondary monitors you have attached, then start Midtown Madness. You should see the window shown below. Click on “OK” and the screen will flicker a little. The game will then start. Watch (or skip, by pressing the Escape key) the opening movie and you should then be at the games title screen. Click the close button at the top right of the screen and quit back out again. Now, download the Midtown Madness Video Patcher from this page (link broken? Let me know here). Again, the download comes as a Zip file. Simply open the Zip file and copy the videopatcher2.exe file from inside the zip file to your Midtown Madness game folder. Now, run the videopatcher2.exe file. The window shown below should then appear. Using the patcher is a two step process and it’s pretty easy. First of all, you need to click on “Browse…” and point the program to your Midtown Madness video.cfg file. This should be in the root of your Midtown Madness game folder (C:\Program Files (x86)\Microsoft Games\Midtown Madness by default). Once you have selected the file, click on “Repair”. A sub-window will open and ask you to choose your “Renderer” and “Resolution”. 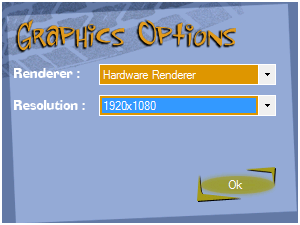 For renderer, you should select “Hardware Renderer”. You can try “Hardware Renderer (T&L)” but it won’t work on many machines. For resolution, choose whatever resolution your monitor supports. While the game was never designed for widescreen monitors, you can run it in widescreen modes without too much distortion so simply choose your monitors native resolution. In the picture below, we’ve configured the tool for our PC running on our 1080p television. Click on “OK” now and the tool will go ahead and patch your video.cfg file. If the patching process fails, see the troubleshooting section under “problems saving games and configuration files”. With the video.cfg file patched, you can go ahead and start Midtown Madness again. There are a few in-game visual settings you might want to change before you start playing. 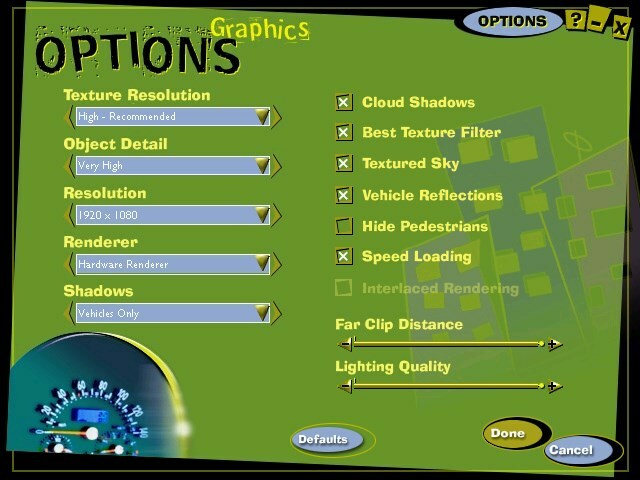 From the main menu, go to “Options” and then “Graphics Options”. The screen shown below should then appear. Since this is such an old game, you should have no trouble turning all the settings up to max even on a relatively modest modern PC. Just configure the settings as shown above then click on “Done”. You’re now done setting graphics options. To configure sound settings, go to the Options menu again but this time select “Sound Options”. There aren’t an awful lot of sound options to configure in this game. If you have a sound card with multiple outputs (e.g Optical and Analogue) you might want to check that Midtown Madness has selected the correct output as for some reason the game does not always choose the system default one. You cannot use the analogue triggers on the Xbox 360 pad for acceleration and braking – For some reason Microsoft configured the Xbox 360 pad driver so that the analogue triggers share the same axis when playing older (direct input) games. This can confuse lots of driving games and prevent others from working properly (since touching both the accelerator and brake at the same time is impossible). Midtown Madness simply won’t work with the 360 controller in this configuration. As a work around, you can use Xpadder and map keyboard commands to the analogue triggers, though of course this means they then become entirely digital, with no difference between slamming the brakes on hard and braking gently. D-Pad cannot be defined – The game controllers D-pad can’t be redefined in the game. Again, Xpadder can come to the rescue here. Steering may be over sensitive – We found that the cars steering was rather sensitive when used with the 360 controller and for some reason the option to change sensitivity was locked out. 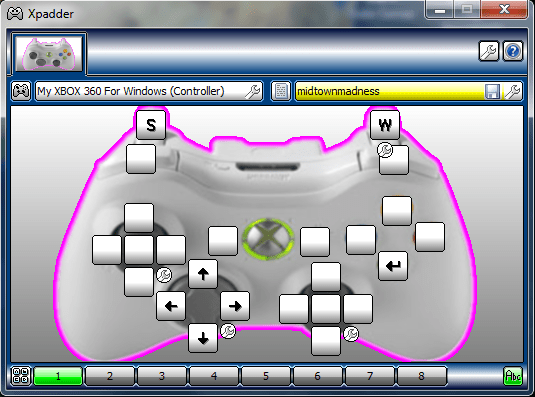 For reference, the Xpadder control scheme we used for the game is shown below. Pretty much as simple as it gets, S and W were assigned to the analogue triggers for accelerate and brake. Enter was mapped to the controllers A (Green) button. This makes it so you can navigate most of the games menus without reaching for the mouse. Finally the arrow keys were mapped to the D-pad, again to make it so that the menus could be navigated. With Xpadder configured like this, it’s just a matter of configuring the rest of the controls in the game to match the inputs you have assigned here, and then configuring the remaining functions (such as steering and the cars horn) using the games own controller configuration settings. With all the options now configured, you’re ready to race. Have fun with this classic little racer and of course don’t try any of this on the real road! Under Windows 8 we were only able to get the game playing in 640×480 software mode. When we configured the game using the video patcher tool, everything appeared to work, but we were not able to select options from the games main menu. For reasons unknown, the game ran at a totally unacceptable frame-rate in Windows 10 no matter which options we tried. Black screen instead of menu – Sometimes when the game starts, rather than display a menu all that appears is a black screen. This can usually be fixed by a simple reboot. Midtown Madness is already running. please activate it from the task bar – This can happen if the installer or the game doesn’t exit properly. To cure the problem, start Task Manager and look for a process called “midtown.exe” “midtown.exe *32” or “MIDTOWN.ICD.”. End the process then try starting the game again. Music doesn’t play, or stops playing – Midtown Madness uses CD audio for its music. In order to hear the music the CD must be in the optical drive that is first alphabetically. So if you had two CD/DVD drives in your PC with the letters E: and G:, the Midtown Madness CD must be in the drive with the letter E:. You may also find that the CD audio does not loop correctly while you play the game, leaving you with no music. Unfortunately there’s no known workaround for this (the game is not compatible with the _inmm.dll tool). Problems saving games and configurations – Like many old titles, Midtown Madness saves its game data and settings into the same folder as the game itself. In some instances on more modern versions of Windows, this will mean that save games and configuration files cannot be written. To solve this problem you can either run the game as administrator (right click on the games icon and choose “Run as administrator”) or, better still, set the permissions on your Midtown Madness game folder so that your user account has full control/read write permissions. You can find a tutorial on how to configure folder permissions here. The games default installation directory is C:\Program Files (x86)\Microsoft Games\Midtown Madness. Virtual machines – Midtown Madness is not compatible with Windows XP running on Virtualbox or VMWare. Can you submit a fix? Do you know how to get this game working in Windows 8? Help the community by submitting a fix in the comments below. Playing the game in 1080p, impressive for such an old title. Interesting, I’ve just been trying this. I have a patch which contains various fixes + DirectPlay updates already, called the “Microsoft® Midtown Madness™ Version 1 (Chicago Edition) Patch”. However the resolution patcher above is useful, definitely. I have that problem too. I thought it was because my cd was scratched, but I guess not. Do you have a link to that patch? How big is it exactly? I may be able to host it on here. hey can you give us the link thanks i think we are all having this problem! Thanks! to me by email if you can, please! My email is: That’s actually not a good idea unless you want an inbox full of spam, besides e-mailing a file that large is impractical. I need the patch too! You can use dropbox to upload large files. The patch is only 2.4MB actually. Microsoft refer to it as the Multiplayer patch here: http://support.microsoft.com/kb/252788/ however the download no longer exists. I have tried the multiplayer patch and after I have applied the patch when I run midtown.exe I get a message which says: Please insert the correct CD-ROM, select OK and restart application. Before I applied the patch, the game works without insert the disk. I have lost my original game disc for Midtown Madness so I dont know if the patch solve my problems or not. Please help! Sorry but we can’t help with things like cracks, missing CDs an the like. I have got a new computer. And Midtown Madness 1 lags on the new computer. It works fine on the menu but it lags when I start a race. Is it any patch available anywhere to solve the problem? If yes, where can I download the patch? If no, can anyone create a patch or give me a tips? The game works fine on my old pc. I am able to select hardware mode the game lags if I use hardware mode. It works fine if I use software mode. On my old pc can I run the game even in hardware mode and the game works fine. But I want to play the game in hardware mode on the new pc without lag. I wonder what the problem is because the new pc has better cpu and video card than the old pc. I wish also a patch so I can read the text and get the text normal. On my new pc, I am able to select hardware mode but the game lags if I use hardware mode. Even if I use the resolution 640×480. My video.cfg contains hardware mode already so the videopatcher doesnt help. Can anyone create a patch so I can run the game in hardware mode without lag? I know the problem is anything with ddraw.dll. I need to update DDRAW.DLL. I have win 8.1 with geforce gtx 960 and do not have lag issues. Did you do both patches listed above? My game downloads fine and when i go to open it it only shows a black screen than turns off. I have changed the compatability to windows 98 but still won’t open. Any ideas? Use compatibilitymod and check disable scaling on high DPI. I dont know if it works for you but try it! 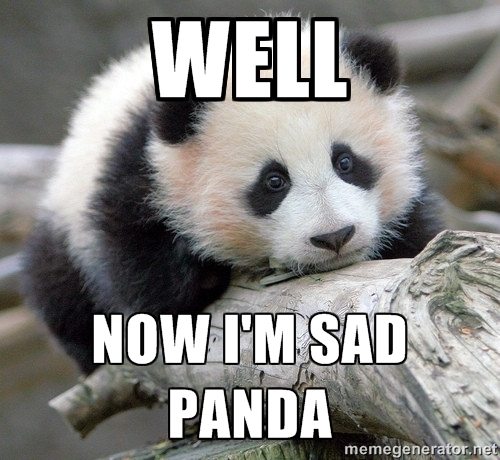 links are dead :( dont now how to get patches. Anyone can help? Doesn’t look like Midtown Madness archives is coming back does it? I’ve re-uploaded the patches for you. i use windows10 i bought the game couple of days befor and it installed perfekt but i cant open it, can some one help me pls? 1) – Install MM1 to My Docs or a another HDD, but not to default installation location (unless you want to right click and click on “Run As Administrator” every time). (PS – There’s an easy fix for that, just change folder permissions). 3) – Extract dgVoodooSetup.exe & D3DImm.dll and DDraw.dll from the folder “MS” to the root directory of Midtown Madness 1. 4) – Run dgVoodooSetup.exe at least once (you could also make changes from within the program if you want, although no promises that any of your overrides or forced changes will work). One thing to do when dgVoodoo2 is running is to go to the DirectX tab and change the VRAM setting to 128~256MB to function best. After that, save your changes and exit dgVoodoo2Setup.exe. 5) – Run Midtown Madness! Note: Cruise Mode works fine, but the frame rate drops with ANY hud displaying (rear view mirror, map, speed o-meter, etc) so, disable all of them to get good FPS. Also, doing any races leads to FPS slow down, again, to the HUD display (timer counter, etc). For anyone who would like to see these steps demonstrated, I will be doing a tutorial for this game (and many other “Old” games on my YouTube page RBsTechCorner. I will post a link for the tutorial as soon as I get the video recording/editing done. Disclaimer: I am not the developer of this software, I’m just informing people how to use this amazing software. Credit goes to: Dege. Thanks! It’s not much fun with all those elements turned off. I know… just trying to give an alternative method to get MM1 playable:) Or just play the Chicago map that was ported to MM2 (google it… getting harder to acquire for some reason) If interested, I can have a download link made from my dropbox. P.S. MM2 works great with dgVoodoo2, by the way. I know this is a little off topic, but I wanted to share this link http://forum.mm2c.com/viewtopic.php?t=16431&sid=5040d9a9ca4243405e200e6d10450c3e — which is the Chicago map converted from MM1 to MM2. For those wanting to drive around Chicago but can’t play MM1, this is as good as it gets. FYI: I didn’t create this conversion of Chicago, just linking this for anyone interested. I got the game to work on windows 10 at 60FPS with Music only. Sound doesn’t seem to work i’m trying to fix that. Actually for some reason i fixed it. apparently it works in game but not in the menus. so you wont be able to hear the vehicles or anything like that before you start. Care to share what you did? i used the dgvoodoo2 and then changed my sound card settings to 44100khz CD Quality and then in MM1/MM2 i changed the sound to Stereo and Medium. That works even with the rear view mirror and HUD? I have widows 8 in my pc . after the screen flickers it says “video board not suppored”. How to fix this. says it contains viruses. I use Norton 360. I know there has been discussion on this and as far as I’m aware, its a false positive. See http://www.vogons.org/viewtopic.php?f=9&t=34931&start=760#p422507 . I believe dgvoodoo2 to be safe, but that is a decision only you can make. I have used it for months and I have not seen any unusual activity on my pc. Happy gaming! There is no doubt in my mind it is a false positive. I Cant Find My CFG File. HELP! Hi there! The reason you can’t see .cfg after the file labeled “video” is because file extensions isn’t turned on, but you don’t need to do that. Just look for the file named “video” (without the quotes). Hope this helps. This issue is most likely due to newer video cards/ video card drivers (although, I had played MM on Win7 years ago, but with older hardware… now play MM on Win8.1 with newer hardware). The industry is not interested (nor Micro$oft) to preserve legacy compatibility for old games. I suggest using dgvoodoo to solve the issue of MM detecting a “suitable” video card. Please check out a posting from RBsTechCorner (my first post up on this page), which gives you a run down to getting MM up and running. Not every aspect of MM works, but I guess better than nothing. Another option is if you own Midtown Madness 2, you can download a ported Chicago map from MM and play it in MM2. Here’s the link if you’re interested: http://forum.mm2c.com/viewtopic.php?t=16431. Also, anyone interested in downloading addons (extra cars, tracks, and mods for MM, check this site out: http://www.mm2x.com/page.php?name=Downloads&d_op=viewdownload&cid=117. Hope everything goes well. I can’t get Midtown Madness to run, I’ve installed the xp patch, tried the videopatch, changed the compatibility settings, but it still won’t run. It goes like this: I start the game, the opening Microsoft logo and Angel studios logo play, then the game crashes and I get the error “Dubug Assertation Failed”. I can’t seem to get around it, and I can’t even figure out whats causing this to happen, and I can’t find any helpful info online. It’s not a matter of adjusting the graphics in-game, I can’t even get to the menu screen. I’ve also tried re-installing the game, and tried vgvoodoo as well. If anyone could help it would be very much appreciated. I should also mention that I have been able to play the Midtown Madness demo on this same computer with no issues. Unfortunately, I have not much to offer except what I researched on the web. Various people suggest using debugging software, but I won’t try to show how to do this due my inexperience with this area. But before diving into debugging, try a few things first. You didn’t state what you changed in compatibility settings, but since you’ve installed the XP patch, ethier set the compatibility to Windows XP or disable everything in compatibility settings all together. Also, make sure to have Windows up-to-date, hardware drivers updated and install the lastest DirectX software. That’s about all I can offer. Hopefully you’ll find the answer you’re looking for. Just for anyone who is interested, I found a work around on PCgamingWiki that should work for someone. . I have tried the fix for Midtown Madness 1 which says in PCgamingWiki and it doesnt work for me. The game lags when I use dgvoodoo. What I do wrong? But, dgvoodoo 2.42 work for Midtown Madness 2 except, I cant see the intro videos. Instead of an intro video, I see only a black screen but I can hear the sound. Why I only see a black screen instead of the intro videos? Is it any settings I have wrong or what is the problem? I believe this is due to a missing video codec. I would suggest to just delete the intro video to eliminate the issue entirely. The only way to ‘kinda’ play this within Windows 10, is to use a Virtual Machine, running Windows 7. For some reason or another the limitation is actually Windows 10, not Midtown Madness. Annoyingly so, but at least you can play in hardware with very good FPS, not 20FPS like this tutorial. Draw back is, you can’t play at any higher resolution than 1024×768. Game will just close during loading. Can have every bit of HUD on, and game plays as it should. Hope this helps some of you! If low framerate on Win10, change name of clockspl.exe to something else and you will get nice smooth framerate. Ok, not funny. It worked once! Literally ONCE! I quit the game to write about how I got smooth gameplay on win10, then got back and again low fps!! Not funny at all. But maybe this will be a clue for someone else why this games behave this way. It doesnt helps for me to rename clokspl.exe. I still have same problem with Midtown Madness. But I use windows 8. I can’t even install the game on Windows 10 64-bit. I have the original cd (Chicago Edition). When I run the setup I get the menu, but after I click the ‘accept’ button it doesn’t show me the installation screen (where you want to install it) it immediately shows me the final screen where it says ‘play’. Does anyone have a solution for this? Because I can’t install the patches because it says ‘no installation of Midtown Madness found’…. I have the game working quite fine, didn’t really do anything but the video patch! Do you or anyone here know? Thanks! Win7 64bit after you install XP patch if you still can’t start the game try using the “No Movie shortcut” in your Midtown Madness main folder. It works for me on two machines and runs great @ 1920×1080 High settings. Hey y’all, just wanted to share with you guys a way to play MM, lag-free. 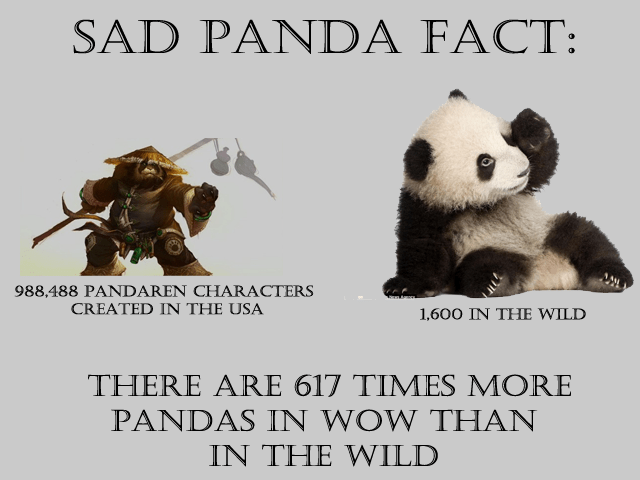 This isn’t my idea (came from pcgamingwiki). The instructions are to rename the Midtown.exe to MidtownMadness.exe (sounds stupid, doesn’t it?) However, I found out that, in fact, it does work! Lag-free gameplay with ALL huds on! Try it for yourselves. *Note: dgVoodoo2 is still needed to function correctly. Just curious… Did anyone try this work around for Midtown Madness? It did wonders for me! if I use dgvoodoo 2.54 and rename Midtown.exe to midtownmadness.exe. But this may not work with amd cards. MM should work with AMD GPUs. My rig’s GPU is an Asus R9 270x. I have another pc with windows 10 and AMD Radeon HD 7400M Series. The fix doesnt work on that pc. Bleh! I’m 99% certain these takedowns were done by a bot, I’ve heard nothing about the ones I counterclaimed on.